Always had your eye on an AGA, but the price-tag of a new one just isn’t in the cards? In most cases, a used AGA is just a pre-loved AGA; think of them as broken in. AGAs are built to last virtually forever after all, so a few years with the Jones’s is barely a drop in the bucket. Not in the Asheville area? Not a problem, we ship regularly all over North America, and occasionally beyond. We’re happy to get a free quote for you to bring the AGA on this page to your door. Nothing on our page? All is not lost, shoot us a line and we’ll let you know when something turns up. We also have some sources we can check with that are not currently listed on our site to find what you’re after. 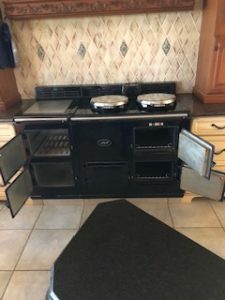 Maybe you’re downsizing and your beloved AGA won’t fit in the new space, or maybe you moved into a home with an AGA and you have other plans. Send us an email and we’ll talk to you about our sellers program and what we can do to help you sell your AGA to a loving home. AGA might be known for their beautiful color range. But when it comes to the classic glossy black not much compares. The black AGA lends itself to modern decor or rustic settings and everything in-between. If you’d like to see this AGA in your kitchen reach out to us for further detail. 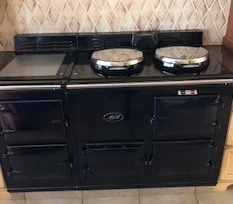 Contact us if you are interested in this pre-owned AGA. Total Control’s are the new kid on the block in the cooker world. But AGA now declares them as their flagship cooker. It’s a pretty rare thing that we receive a pre-owned TC3 but we are thankful to have found this one. This beautiful find is just waiting for a new home. There is not much more enjoyable than cooking with an AGA. 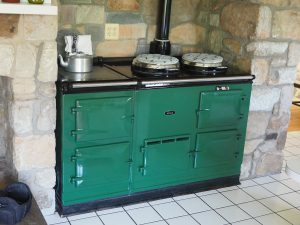 Of course, when your AGA is as stunning as this one, well, that helps. This AGA gets a great report from the AGA tech and has been very well maintained and cared for. In addition a couple of AGA cookbooks, the infamous AGA toaster and the AGA steel bristle brush is also included. In other words, this AGA is ready to move in and start cooking. We have lots more to tell and show about this wonderful cooker. Contact us now for more info. If you think that this cooker looks a little different, well you’re right. But don’t be alarmed, the owners had a faux vent pipe built on to give the impression of symmetry. So just picture the left vent pipe gone and you are seeing things clear again. This has been a very well cared for AGA and you will enjoy many years of cooking to come with this cooker. For the kitchen that isn’t cooperating with a standard vent or a direct vent cooker, comes the power vent. Created so you can have more freedom in where you place your AGA, the power vent can be a life saver. This dark blue cooker, though shown in dim light is a beauty, just look at how clean it’s been kept. You will love this cooker in your home. Well we did it again, we found another beautiful Pillar Box red AGA Cooker! The cooker is in great shape but does need a little cosmetic repair on it’s top plate. But we look at that kind of thing as something that only shows that an AGA has been well loved and appreciated. We like to call blemishes a cooking history, it adds character. The cooker was installed, serviced and uninstalled professionally, it’s now crated and ready to find a new home. The AGA is set up as LP but can be set up as Natural gas. The cooker is also the classic standard vent model. British Racing Green, the color synonymous with companies like Aston Martin and Jaguar is equally as classic and desirable on an AGA Cooker. This cooker is in great condition mechanically and aesthetically. It’s ready to sport up your kitchen and throw down some fast cooking. The cooker is currently an LP unit but can be converted to NG and requires a direct vent installation. This British Racing Green cooker has been well loved. It is a standard vent model and its owners have taken great care of it. It is a one owner cooker purchased new. One half of the couple that owned it was British and the other lived in the UK for sometime. So they are true AGA connoisseurs and have kept the cooker in spectacular shape. Why are they parting with it? They’re moving to the beach and the kitchen is too small, otherwise you can bet they’d be cooking on the AGA shoreside. More info available upon request. A beautiful 4-Oven, direct vent cooker, just waiting to put out some Lancashire hotpot. More info available upon request. What happens when you combine the best of AGA’s heat storage classic cookers with the conveniences of a conventional range? You get the beautiful 6-4. A dual fuel range the cooker style ovens are electric with two having convection capabilities. On top you get 6 gas burners. This AGA is ready for some serious cooking! This one owner claret cooker will brighten your kitchen for those looking in and will brighten the day even more so for those dining in. 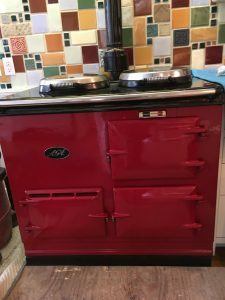 Great condition, beautiful color and standard vent, the classic AGA package. More pictures and info are available upon request. Claret is a classic AGA color and one coveted by AGA-philes and once it’s in your kitchen you’ll see why. This cooker is in great condition mechanically and has been well loved over the years. The cooker is currently a natural gas unit but can be converted to LP and requires a standard vent installation. More pictures are available upon request. 9 out of 10 ranges asked said they'd rather be an AGA. 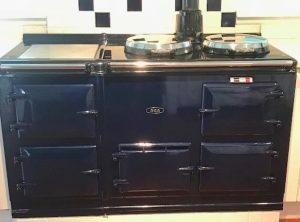 Interested in a Pre-owned AGA listed or want us to keep an eye out for a specific one?